On February 18th, 2010 , I arrived in St. John’s, Newfoundland to play at the Fat Cat Blues Bar with Dr. Zoo. We all arrived late in the afternoon after a long flight from Toronto, and after checking into the hotel, we didn’t really have a lot of time (nor energy) to really discover St. John’s or do any exploring. We left St. John’s the next morning and flew to Labrador City on a small plane. The plane (and airport) was so small that you had to walk onto the plane! LOL If you don’t like flying, this is not for you. I personally don’t mind flying at all, but the amount of turbulence we experienced was crazy. The plane also felt like it was going to fall apart each time we took off and landed. (There were several stops throughout Labrador on our way to Labrador City, which is actually a very small town, not a city at all.) Very small planes indeed. 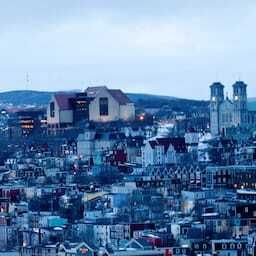 St. John’s Newfoundland was published on Sunday, March 21, 2010 at 2:18pm EDT by Daniel Menjívar and last updated on April 11, 2018 at 9:30pm UTC .